Fans of photographic picture books like William Wegman's and Naptime with Theo and Beau will love this adorable look into the friendship of a little girl and her pet piglet-now available as a board book, with chunky pages just right for toddlers! 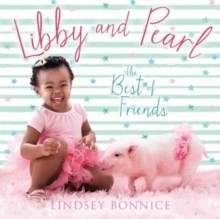 Follow the charming real-life adventures of two unlikely pals in Lindsey Bonnice's Libby and Pearl. Lindsey created an Instagram feed of her adopted daughter, Libby, and their family pig, Pearl-and the photos immediately went viral. They were covered on Huffington Post, Buzzfeed, and HelloGiggles. Libby and Pearl's debut, which was praised as "a visually tactile wonderland," is the perfect gift for baby. These irresistible photos celebrate love, friendship, and the people-and animals-we hold close.